The attack time of AGC looks ridiculously loooong. Tau= 100kOhm * 100uF = 10s ! Am I missing something? Maybe the fact that the capacitor is connected directly to the base and therefore discharges rapidly? And that there is a high amplfication in the AGC amplifier strip that will show the first effect on the MC1350 long before the capacitor is fully charged? Yes, it uses very small amount of a charging curve (even if 1/100ths, its still 100ms – way too much), and then again – where is proper decay time constant chain built in? Look at these: http://www.karinya.net/g3txq/cubii/bfo.jpg and http://www.sgcworld.com/Publications/Manuals/2020man.pdf (page 57), also some Ten-Tec models used this circuitry for the MC1350. I have tried – works very well for audio derived AGC! Attack time here is defined by R=270 Ohm and C=10uF (RC=2,7ms), decay time – by R=330k and the same capacitor (RC=3,3s). Have You done any audio recordings from your transceiver? 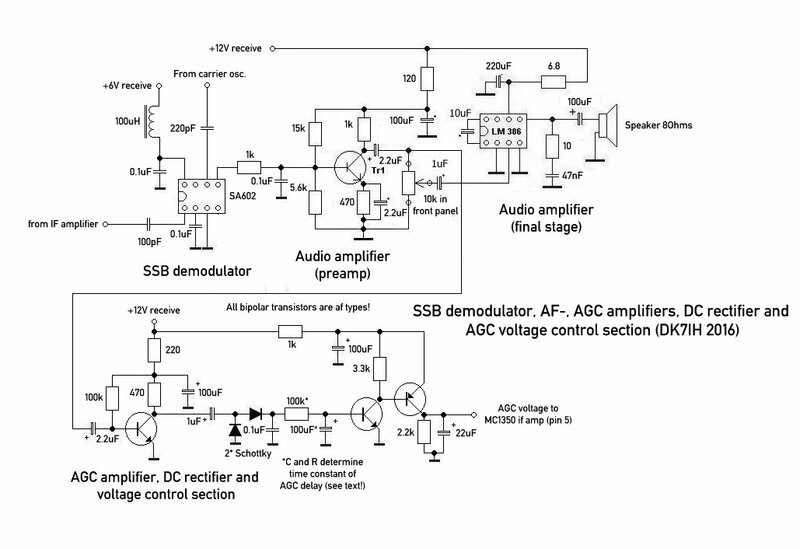 and http://www.sgcworld.com/Publications/Manuals/2020man.pdf (page 57), also some Ten-Tec models used this circuitry for the MC1350. 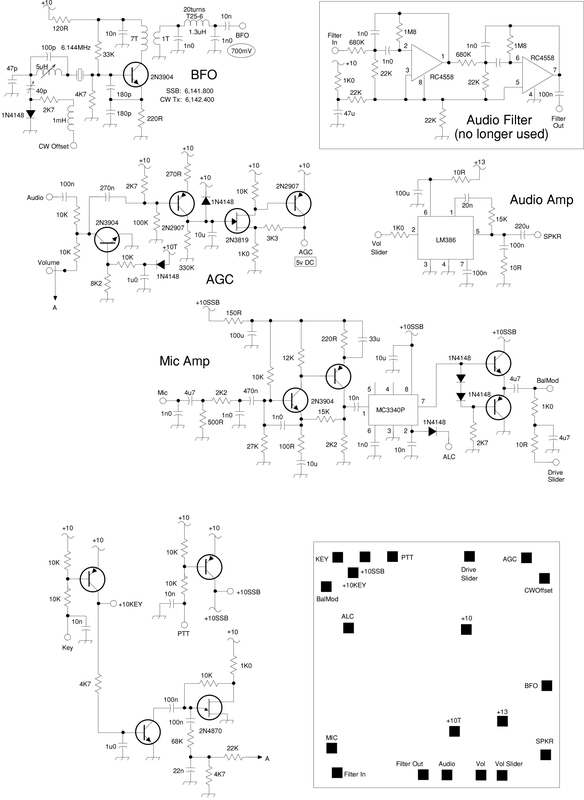 I have tried – works very well for audio derived AGC! Attack time here is defined by R=270 Ohm and C=10uF (RC=2,7ms), decay time – by R=330k and the same capacitor (RC=3,3s). The built in (rather squeezed in :)) speaker sound quite good. But AGC works terrible (too slow in attack, and may be faster than needed at release). Yes, the attack time really is in a 100ms ball park, when it should be around 1ms. Hello Peter, i read to proyect, is posible optain the complet circuit?, i have 3 parts of the proyect.